We estimated annual apparent survival rates, as well as local recruitment rates in different age groups and for different breeding status in the common tern Sterna hirundo using mark–recapture analysis on a long-term individual-based dataset from a breeding colony in Germany. Strong inter-annual variability in survival rates became apparent, especially in prospectors. Local recruitment also varied strongly between years and age groups. To explain these fluctuations, we linked survival and recruitment estimates to several environmental covariates expected to be limiting during the wintering period and migration, including the global climate indices of North Atlantic Oscillation and Southern Oscillation, fish abundance indices, and marine primary productivity in the West African wintering area. Contrary to expectations, global indices did not seem to be linked strongly to vital rates. Results showed that primary productivity had the strongest effect on annual survival, especially in young and inexperienced individuals. Primary productivity in the wintering area was also strongly associated with the probability of recruitment in the following breeding season, indicating that conditions during winter can have carry-over effects on the life cycle of individuals. The effects of habitat alteration and climatic instability have resulted in the loss of bird populations throughout the globe. Tropical birds in particular may be sensitive to climate and habitat change because of their niche specialization, often sedentary nature, and unique life-cycle phenologies. Despite the potential influence of habitat and climatic interactions on tropical birds, we lack comparisons of avian demographics from variably aged forests subject to different climatic phenomena. Here, we measured relationships between forest type and climatic perturbations on White-collared Manakin (Manacus candei), a frugivorous tropical bird, by using 12 years of capture data in young and mature forests in northeastern Costa Rica. We used Cormack–Jolly–Seber models and an analysis of deviance to contrast the influence of the El Niño Southern Oscillation (ENSO) on manakin survival. 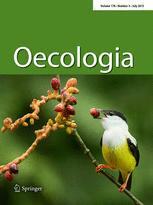 We found that ENSO had little effect on manakin survival in mature forests. Conversely, in young forests, ENSO explained 79 % of the variation where dry El Niño events negatively influenced manikin survival. We believe mature forest mitigated negative effects of dry El Niño periods and can serve as refugia for some species by buffering birds from climatic instability. Our results represent the first published documentation that ENSO influences the survival of a resident Neotropic landbird. In some ecosystems, vertebrate herbivores increase the nutritional quality and biomass of their food source through repeated grazing, thereby manipulating their environment to support higher densities of animals. We tested whether ptarmigan (Lagopus lagopus and L. muta) are capable of regulating the nutritional quality, abundance, and availability of feltleaf willow (Salix alaxensis) buds using a simulated browsing experiment and a feeding preference study with wild birds. Simulated ptarmigan browsing resulted in smaller buds, but greater numbers of buds per shoot. Furthermore, browsing altered the morphology of willow branches such that buds were at higher densities and closer to snow level compared to unbrowsed controls. Browsing increased the number of willows with accessible buds (buds within 50 cm of snow level) from 55 to 89 %, and increased total accessible bud biomass from 113 ± 30 to 129 ± 50 mg/ramet. Browsing did not affect bud nitrogen or carbon concentration and slightly reduced protein precipitation capacity (tannins) in buds the following winter, indicating that ptarmigan browsing does not induce a defensive response in this species. When branches of broomed (previously browsed) and unbroomed willows were placed in the snow at equal heights, ptarmigan showed no preference for either type; however, they obtained more buds from broomed willows. Increased accessibility and density of willow buds caused by browsing has the potential to increase habitat carrying capacity, thereby supporting higher densities of ptarmigan. Interactions between flowers and their visitors span the spectrum from mutualism to antagonism. The literature is rich in studies focusing on mutualism, but nectar robbery has mostly been investigated using phytocentric approaches focused on only a few plant species. To fill this gap, we studied the interactions between a nectar-robbing hermit hummingbird, Phaethornis ruber, and the array of flowers it visits. First, based on a literature review of the interactions involving P. ruber, we characterized the association of floral larceny to floral phenotype. We then experimentally examined the effects of nectar robbing on nectar standing crop and number of visits of the pollinators to the flowers of Canna paniculata. Finally, we asked whether the incorporation of illegitimate interactions into the analysis affects plant–hummingbird network structure. We identified 97 plant species visited by P. ruber and found that P. ruber engaged in floral larceny in almost 30 % of these species. Nectar robbery was especially common in flowers with longer corolla. In terms of the effect on C. paniculata, the depletion of nectar due to robbery by P. ruber was associated with decreased visitation rates of legitimate pollinators. At the community level, the inclusion of the illegitimate visits of P. ruber resulted in modifications of how modules within the network were organized, notably giving rise to a new module consisting of P. ruber and mostly robbed flowers. However, although illegitimate visits constituted approximately 9 % of all interactions in the network, changes in nestedness, modularity, and network-level specialization were minor. Our results indicate that although a flower robber may have a strong effect on the pollination of a particular plant species, the inclusion of its illegitimate interactions has limited capacity to change overall network structure. Many animals have adapted to the proximity of humans and thereby gained an advantage in a world increasingly affected by human activity. Numerous organisms have invaded novel areas and thereby increased their range. Here, we hypothesize that an ability to thrive in urban habitats is a key innovation that facilitates successful establishment and invasion. We test this hypothesis by relating the probability of establishment by birds on oceanic islands to the difference in breeding population density between urban and nearby rural habitats as a measure of urbanization in the ancestral range. This measure was the single-most important predictor of establishment success and the only statistically significant one, with additional effects of sexual dichromatism, number of releases and release effort, showing that the ability to cope with human proximity is a central component of successful establishment. Because most invasions occur as a consequence of human-assisted establishment, the ability to cope with human proximity will often be of central importance for successful establishment.